The End of My Naked Bee Keeping Lifestyle. As many of you know from the pictures I keep very close to the bees when I tend them relying on a minimal amount of safety equipment. Unless I am installing a package, I usually only wear my vail and break out the gloves when I am unsure what kind of trouble I may get into moving frames. 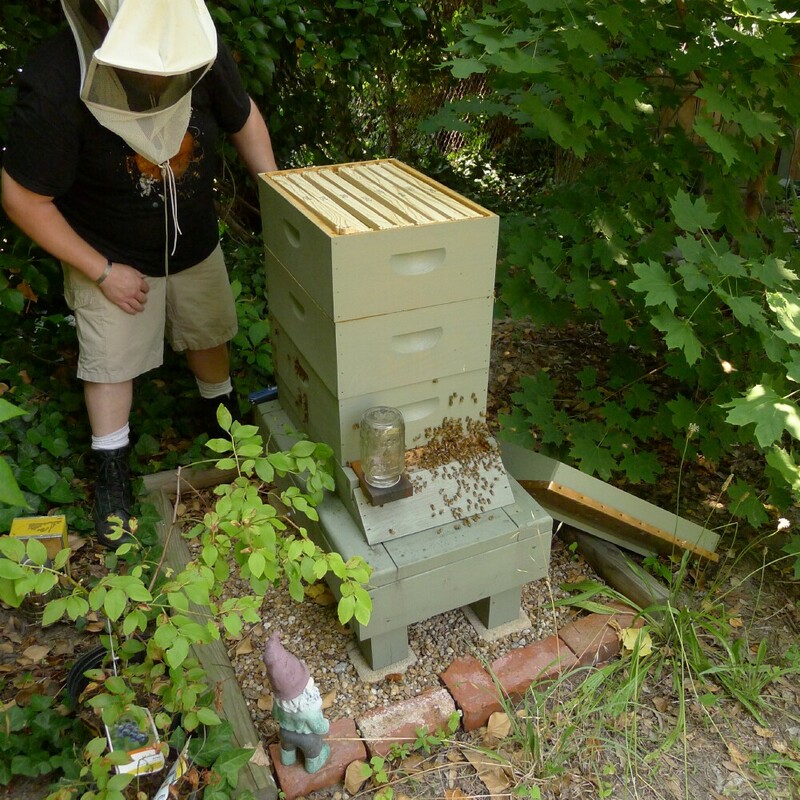 I have always believed in the gentle nature of the bees and not being covered in bulky equipment allowed me to judge the temperament of the hive as well as be mindful of all the bees present in order to avoid the estimated average 200 accidental kills during a hive check. In the past three years as a keeper I have about 19 stings to my credit. About 4 of those have been on my head at various times when I wasn't officially doing a hive check, just poking around near the hive, most of the stings happened on my fingers and arms during hive checks. This is my very first sting in 2009. 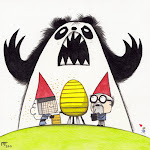 I never considered myself allergic to bee stings. Like typical stings there was swelling around the entry point and a little discomfort nothing more. 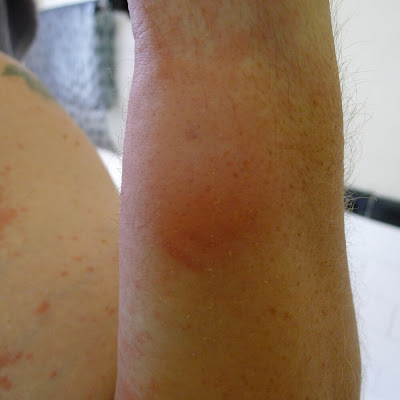 The stories of the old time beekeepers told me that having your body exposed to the bee venom allows you to build up better antibodies against it, a little bit of the theory of immunotherapy, if you are exposed to trace amounts you eventually develop a tolerance to that which may affect you. How many times have you been told about if you have problem with pollen allergies eat a regiment of local honey to help alleviate them? It is the same principal idea. Smoke as you may know is the beekeepers friend it sends the bees into a panic mode as they go looking for honey stores to gorge on just in case they need to evacuate the hive. It also disrupts the communication pheromones that would send them into defense mode. By the sheer number of bees on the outside of the hive, I knew B2.1 was in a desperate need of another super they were over crowded and hot. 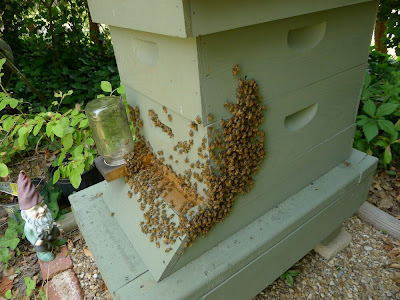 There is a reason why bee keepers work from the back or side of the hive, you stay away from the entrance where the majority of the bees are. 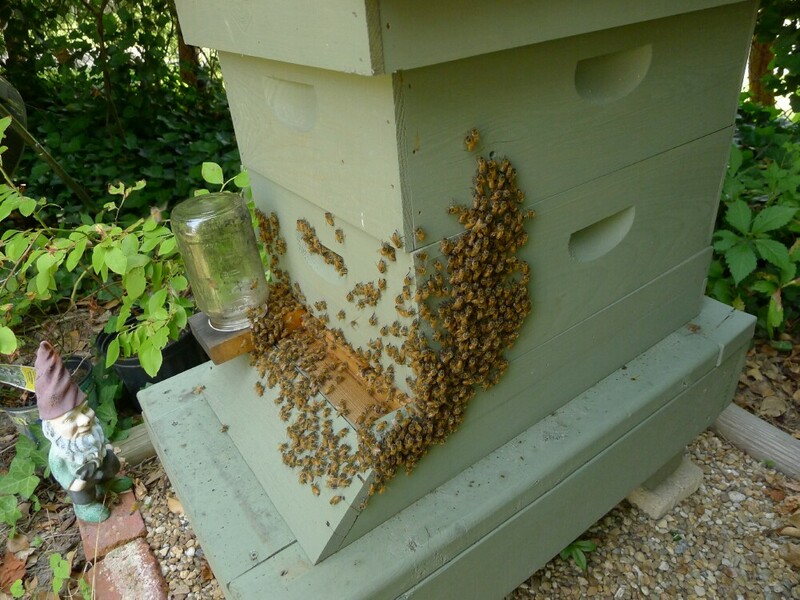 Yesterday when the bees were smoked they spread out all over the outside of the hive instead of heading inside. This was not an ideal situation since I no longer had a safe side to work from. I went forward with my work being more mindful of my surrounding and successfully added that 3rd super, with communication disrupted by the smoke it would would take a little while for all of the bees to find their way back into the hive and into their new addition. 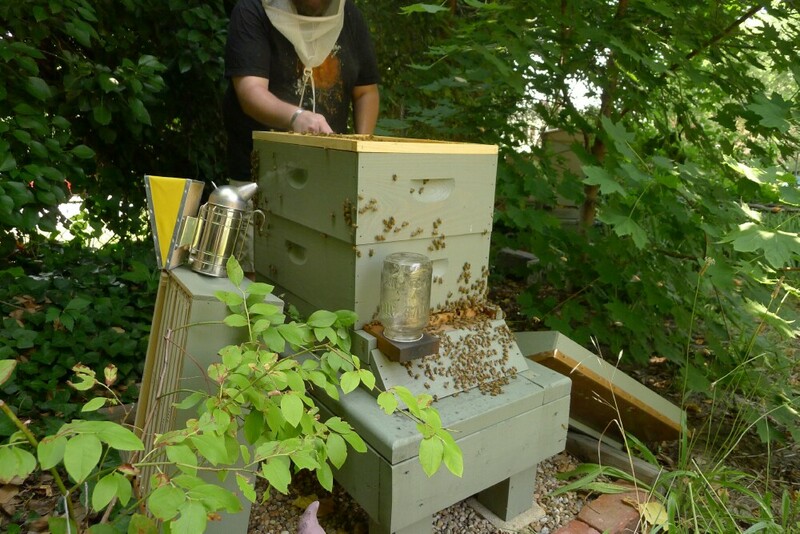 While closing up of the hive I didn't want to crush any of the bees so I was brushing the bees off the top cover and that was when I received a sting near my watch band on my left arm. 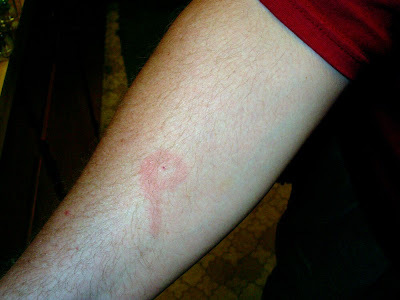 It hurt like you would expect it to, I got the stinger out and smoked the area of the sting to hide the “attack here” pheromone that I had been tagged with. I finished up my hive duties outside put away my bee keeping supplies and came inside to wash up. It had been about 15 minutes since the sting, and it was then I noticed the rash going up my arm. 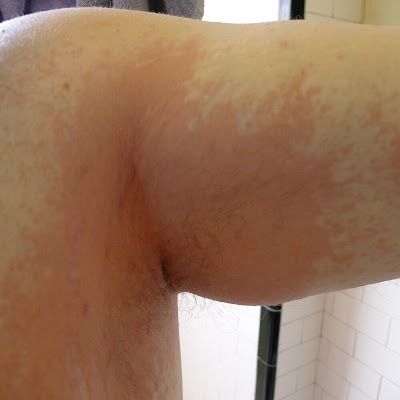 The rash up to my armpit. Although only the 1st one was really present and the other three were minor, she decided I probably should go visit our local non-emergency care facility, which we did. A shot of steroids there and another 12 day prescription for more, I left with a scolding from the doctor for not using our epi pen when the reaction started, and the knowledge I may now have developed an allergy to bee stings. I am now left with new tasks to undertake- (a) Finding out if I may be a candidate for real doctor prescribed immunotherapy. (b) Finding more needed safety equipment to begin a new journey as a beekeeper who is allergic to bees, which basically leaves me no other choice, but to do as Barney Stinson would say: “Suit Up!”. 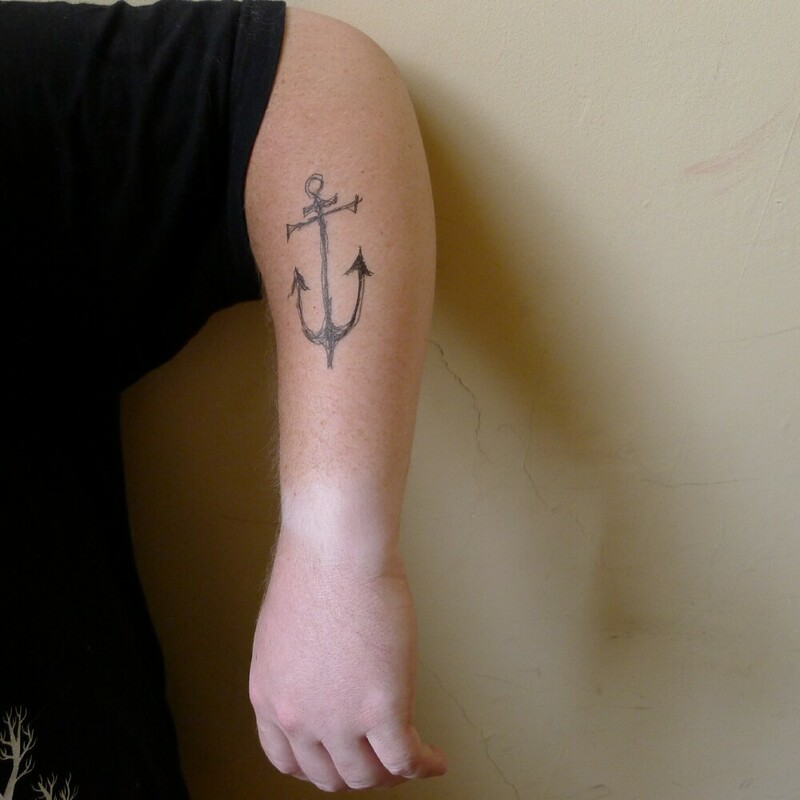 Feeling much better than I did a day ago, for now I'll suffer the "Popeye arm" taunts of my wife who very happily decorated it with the obligatory sailor anchor.